With March Madness fast approaching, there's a definite need for simple snack recipes - perfect for munching on during the game. 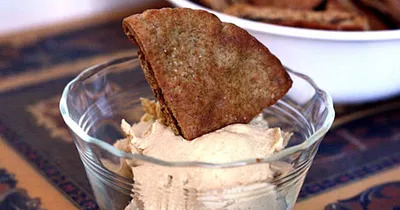 Hummus and pita chips are one of my favorite go-to munchies, which can seem like a healthy option, but choose the wrong pita chip and you'll turn this snack into a nutritional nightmare. So I decided to give this traditional pita chip recipe a face lift—making it a slightly better version of its classic self while keeping that delicious pita chip flavor that’s sure to please a crowd. Using the following simple substitutions, you and your friends will be happily crunching away by tip off! These came out of the oven crisp, crunchy and hearty enough to hold up to heaping scoops of hummus. The garlic flavor came through perfectly and the whole wheat pita substitution gave the overall chip a solid crunch that was completely satisfying, making it easy to stop at just a small handful rather than devouring the entire bowl before halftime!